Terry Rommereim ’78, M.Div. ’86, makes his rounds on a Friday morning at the VA hospital in Fresno. Some 70 years since having his B-17 shot down over Nuremberg and spending seven or eight months as a prisoner of war, Thomas Richardson, 96, decided he wanted to be baptized. 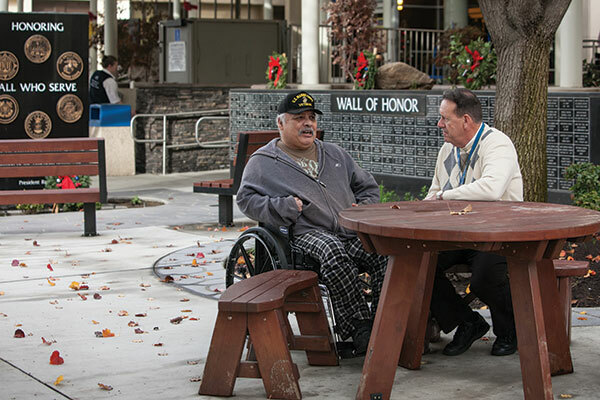 Family members came in to the Fresno VA’s long-term care facility in December for a brief ceremony presided over by lead chaplain Terry Rommereim ’78, M.Div. ’86. Army veteran “Wild Bill” Begley, 93, remembers the suffering of starving Filipino and American prisoners on the Bataan Death March in 1942. He says he was bayonetted and scheduled for execution. Rommereim doesn’t perform as many baptisms as he once did. After studying at Pacific Lutheran Theological Seminary in Berkeley, which is now part of Cal Lutheran, and earning a Doctor of Ministry at Fuller Theological Seminary, he was an associate or solo pastor for many years in Los Angeles and Orange County and later a senior pastor in Fresno. Although he thought he’d always be a parish pastor, “God had other plans for me,” he said. 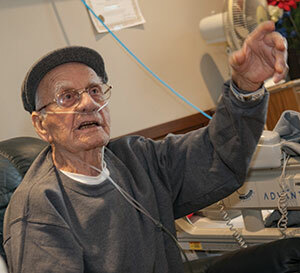 Air Force veteran Thomas Richardson, 96, who can no longer hear, says he was not a hero in the war: “I just did what my conscience told me to do.” He was baptized days before our visit by Chaplain Rommereim. As full-time chaplain since 2010, he has a range of duties with the Department of Veterans Affairs – including a grief support group, a palliative care team and worship services – but spends most of his time now on “sheer ministry” rather than administrative tasks. He works with veterans who served in every decade since World War II on issues of chemical dependency, post-traumatic stress disorder, injuries to body and brain, and the moral injuries suffered by those who face death, fighting, killing and the guilt of survival. Last year, the Fresno VA dedicated a new mental health facility, anticipating need from soldiers back from Afghanistan and Iraq. Army veteran Bob Metzler, 93, tells about his unit’s arrival in France with “nobody shooting at us” and three weeks spent in villagers’ homes. “I’ve had a lot of God’s mercy in my life,” he says. 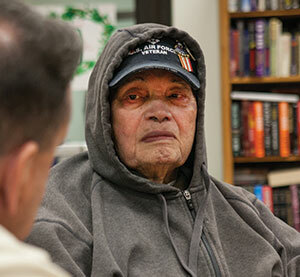 Personal experience has helped Rommereim to understand where veterans are coming from. His father was in the military, once stationed in Japan. Like too many veterans, he has suffered from depression; discovering his vocation as a chaplain helped him to overcome it. 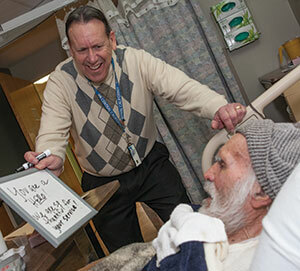 About 18 months ago, he suffered a traumatic brain injury when struck by a car.